If you are in to reading, which I am assuming you are, please take a moment to consider entering into a challenge. 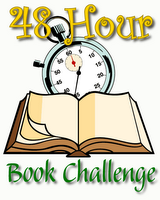 It is the Mother Reader's 48 Hour Book Challenge. You can read all about it by clicking on that fancy little button to the side. Meanwhile, I should let you know that the Kidlitosphere Bloggers of Central Ohio will be getting together the morning of June 6th to enjoy a breakfast together and a visit to the wonderful book store Cover to Cover. (This has become a little tradition for celebrating all kinds of book related events) Since part of the 48 Hour Book Challenge this year challenges you to make a donation to something you feel strongly about, the Central Ohio peeps have decided to donate to Mary Lee of A Year of Reading. She is participating in a Fish-a-thon to rasise money for a nonprofit organizaiton that offers no-cost retreats for breast cancer survivors. Long story short, I don't think I can make the trek up to Columbus that morning so I am pledging $1 for every book taken out of Cover to Cover by ALL the Kidlit Bloggers of Central Ohio. So tally up your books, gang, and send me a bill! WOW! And you've been there when we've shopped before so you know what is possible;-) I feel like I am buying for a good cause so I may go overboard:-) We'll blog your total after the shopping. We'll even take photos -wish you were coming. We'll miss you! Wow! What an incredibly generous offer. Mary Lee will be so grateful for the support of such a wonderful cause! Have a great day! We will miss you! You (and all the other Central OH Kidlit Bloggers) ROCK MY WORLD! Thank you SO much for supporting Casting for Recovery! But if you meet that weekend, it will cut into your reading time! I'm not even going to do laundry or cooking that weekend. My family has been warned. Maybe next time!